The Ryobi 18-Volt ONE+ Lithium-Ion Starter Drill Kit features a 3/8-Inch keyless chuck with a 24-position clutch that adjusts the torque output to control the depth of the screw or fastener. The drill features the exclusive MagTray and onboard bit storage, which allows convenient placement of bits and screws. This kit is powered by an improved lithium-ion battery that holds a charge up to four times longer, offers up to 20% more run time and is 45% lighter weight than NiCd batteries. Best of all, like all 18-Volt ONE+ batteries, the included battery works with every ONE+ tool ever made. The Bosch PS22BN 12 V Max EC Brushless Two-Speed Pocket Driver delivers great power for the most compact and lightest weight drill/driver in its class. This small but beefy workhorse packs an EC Brushless motor that delivers 180 In.-Lbs. of torque. The two-speed transmission has a high-torque setting for driving and a high-speed drilling setting, and it has 20+1 clutch settings for max versatility. At only 1.6 Lbs. and with a head-length of only 5.3 In., this cordless drill is great for electricians or MEP pros who have extended overhead or hard-to-reach applications. It has a 1/4 In. quick-change hex and a belt clip and bit holder for portability. Fast-running single-speed drill (battery-powered) with excellent speed stability, up to 6 mm in steel in metal construction. Outstanding quality battery-powered drill with high concentricity for precise drilling results. Maintenance-free, brushless and highly-effective EC motor with good speed stability. Optimum speed for lower diameters and therefore economic working with efficient use of the machine. Self-tightening drill chuck clamping jaws and automatic spindle locking and single sheath quick clamping drill chuck. Powerful, durable DC motor with protection against overheating and overloading. 2-speed solid metal gearbox for universal drilling and screw driving work. Robust, solid metal drill chuck with chucking power safeguard and mechanical torque setting.350 screw connections (5x40 mm) with one battery charge (2.5Ah). 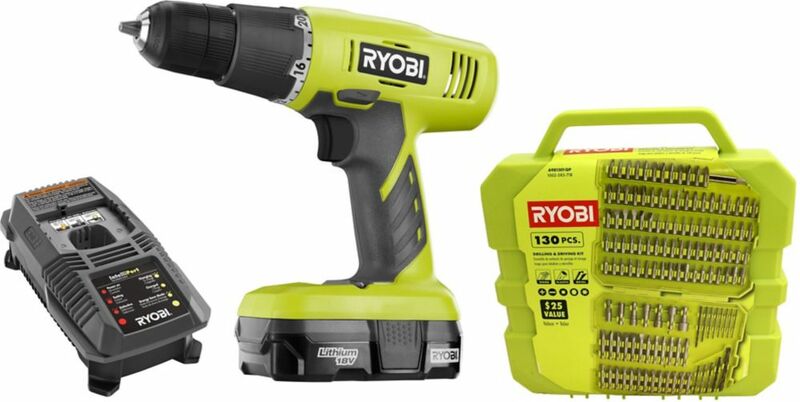 18V ONE+ Drill/Driver Kit with 1.3 Ah Battery and 130-Piece Bit Set The Ryobi 18-Volt ONE+ Lithium-Ion Starter Drill Kit features a 3/8-Inch keyless chuck with a 24-position clutch that adjusts the torque output to control the depth of the screw or fastener. The drill features the exclusive MagTray and onboard bit storage, which allows convenient placement of bits and screws. This kit is powered by an improved lithium-ion battery that holds a charge up to four times longer, offers up to 20% more run time and is 45% lighter weight than NiCd batteries. Best of all, like all 18-Volt ONE+ batteries, the included battery works with every ONE+ tool ever made.